The work I will be discussing is Contra-Internet Totality Study #2, (hereafter referred to as Study #2) by Zach Blas. The work is a triptych, comprised of three animated GIFs. Each section of the triptych (which is also a separate file) consists of a 3D globe, which has a stock image as its skin. Specifically, a stock image that is meant to visually describe or represent the Internet and/or information technology generally. It is part of a larger project called Contra-Internet, which, according to its own manifesto, “critiques the Internet as a hegemonic descriptor for digital networking and premier arena of political control…refusing the neoliberal logic of ‘the Internet’ while building alternatives to its infrastructure.” In accordance with this, Study #2 seeks to challenge the established conception of the Internet and its functions, by highlighting just how standardized its representation is in mainstream media sources. Before going on, I must first address the fact that this review is meant to be of an artistic intervention “in an urban setting.” The question then, is whether or not the Internet can be considered “urban.” While almost always considered public, (the truth of which Blas himself might call into question) the Internet is not typically thought of as being specifically urban. Even though the majority of both its users and its infrastructural centers are found in urban areas, the established belief about the Internet is that it exists everywhere, and can connect even very remote populations, well outside of major cities. While this is true in the technical sense, it is my opinion, (based on my research into Blas and the Contra-Internet project) that the sorts of regulatory forces the artist perceives to be operating within and through the internet would constitute an “urbanizing” influence. I therefore contest that Blas would not object to my classification of Study #2 as a work of urban art, which makes its use in this context valid, even if the idea of the Internet as urban cannot be firmly established in a more overall sense. My analysis of Study #2 will primarily focus on the idea of the counter-monument, as it is used by James Young. Before getting into this however, I would like first to briefly discuss it in the context of Nancy Fraser’s work on transnational public spheres. In class, we discussed some of the potential problems or shortcomings of Fraser’s essay, which included the idea that it makes assumptions regarding the inherent democracy of certain transnational systems, including communication networks like the Internet. It seems to be Fraser’s assumption that the Internet, as a platform for discussion beyond national borders, is something which is not regulated or restricted in either access or content. Blas’ argument, upon which Study #2 is based, is that the Internet is in fact having the opposite effect. That it represents a regulatory force that only makes existing restrictions against inclusion or expression more entrenched, not less. While our class discussion covered the idea that Fraser’s assumptions may have been incorrect, we did not, (as a group at least) consider Blas’ viewpoint, which comes from the opposite extreme. I therefore thought that it merited inclusion here. Moving on to Young, and the idea of the counter-monument, I wish again to make a case for taking an unconventional (and potentially controversial) stance in regards to the classification of the Internet. Just as I argued above for viewing the Internet as an urban space, I now put forward that, for the purposes of this discussion, it can also be considered a nation. Blas’ work describes it as a hegemonic force for globalization, with far-reaching political and economic regulatory systems. This, as well as other factors (related to control of communications, infrastructure, etc.) combine to form the impression of something in keeping not only with traditional ideas of the nation state, but of one which is extremely un-democratic. Once again contradicting Fraser, Blas’ work argues that transnationalism, as it operates through the Internet, empowers state-like systems more than it does any kind of public sphere. Based upon this, I feel comfortable (once again, only in regards to this particular work) in discussing the Internet as a form of nation. And as with every nation, (as Young tells us) it has its own national histories, memories, and mythologies. Figures such as Charles Babbage and Ada Lovelace, Alan Turing, and Steve Jobs and Steve Wozniak figure prominently into this mythos. A large part of the Internet’s national mythos, (possibly due in part to the inclusion of a woman and a homosexual amongst its “founding fathers”) is its own inclusivity and democratic nature. This makes it similar to aspects of the Canadian national mythos which we discussed in class, in which the nation’s own tolerance and peacefulness is repeatedly ingrained through its history and monuments, regardless of how accurate those descriptions are. Blas’ work, not unlike Jeff Thomas and his works based around the “Indian Scout” statue in Ottawa, challenges and seeks to renegotiate this mythos. Within this context then, I believe that Study #2 exists as a counter-monument against the “national mythos” of the Internet. Unlike some of the counter-monuments described by Young however, Study #2 does not directly invert ideas of the monument itself. Instead, it operates by condensing and then inflating the imagery that a conventional monument would have until they become absurd. It takes stock images about the Internet, which in their original contexts reinforce the ideas and attitudes he’s challenging, and then by bringing them together into the triptych and recontextualizing them, he inverts their meaning but not their form. In this way he seems to be operating in what our readings and discussions identified as “the third space.” It is important to note here that the Contra-Internet is, to paraphrase its own words, “not about unplugging,” but rather seeks to challenge the existing Internet in order to reconstitute it. It therefore operates between the established Internet, (here used as an expression of nation) and those movements which seek to fully abandon it and its related technologies (such as neo-luddites). In addition to my review, I have also begun a work of web-art, directly inspired by (and essentially an adaptation of) Blas’ Study #2. 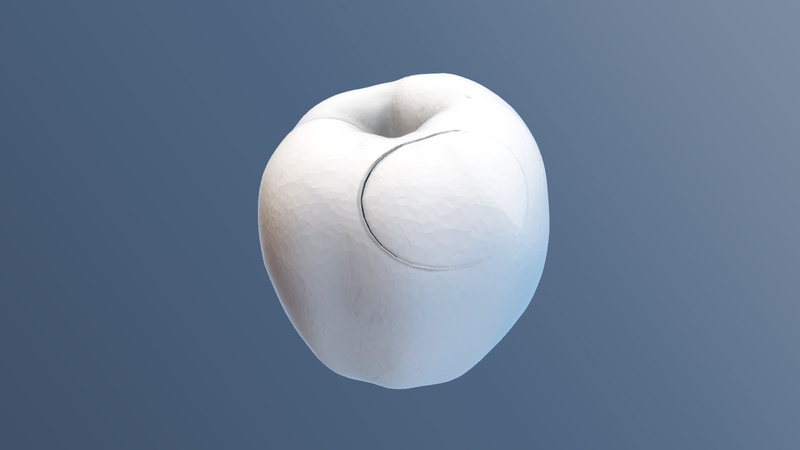 Titled simply Countermonument, it will, when completed, depict a rotating 3D rendering of an apple, which has had a bite removed and then (visibly) reinserted into its side. The obvious connotation of being a challenge to the Apple logo is of course a part of the work, and intended to be a source of humor. Moving further back however into the “national history and mythos” of the Internet, it also engages with Alan Turing, one of the Internet’s “founding fathers,” who committed suicide by (according to the mythology) ingesting a cyanide-laced apple. It is also meant (In keeping with our discussion of religion as a type of borderless public) to be a nod towards the ultimate western origin myth, that of the Garden of Eden. By overlapping multiple references, (some lighthearted, some serious) which have incongruous interpretations and critiques against them, it is meant to operate within a more ambiguous space, as Blas does; questioning, rather than trying to dismantle the Internet. I have included a still image for now, and will upload the full work once completed.